Visitors and locals agree that Dolly Parton's Dixie Stampede Dinner and Show in Pigeon Forge, Tennessee, is full of fun, action-packed entertainment that everyone should experience! It’s the perfect place for families, friends and groups to gather for sensational special effects, and amazing stunts by the most talented performers the area has to offer. 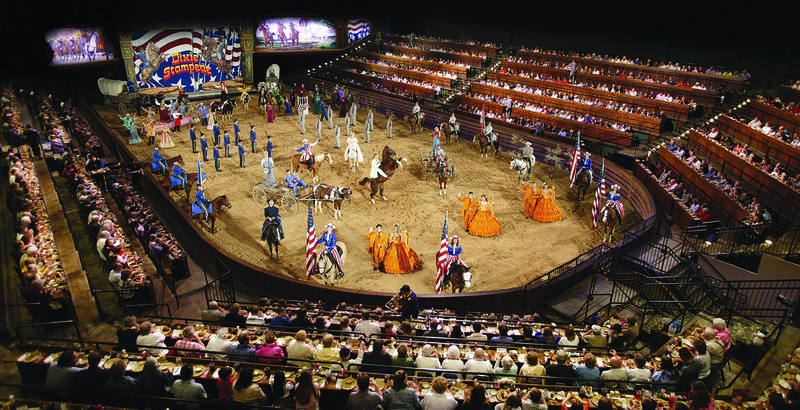 At the Dixie Stampede, each ticket includes the show's special Saloon Opening Act, the thrilling main performance in their beautiful arena, and a mouth-watering four-course dinner complete with a delicious dessert. Showcasing the skills and talents of live animals and their handlers, Dixie Stampede is a phenomenon of performance arts. Dramatic lighting, sound and pyrotechnics add to the experience and make you feel like you're in the thick of an exciting rodeo. During the show you'll be delighted by the bluegrass and country music band, dance choreography, comedy, and of course, the live animal performances. You might even be lucky enough to see Dolly Parton herself stop by for an appearance! The Saloon Opening act (aka Mountain Rukus) starts 50 minutes prior to their sensational show so if you're really looking forward to the main act, you're not going to want to miss out on this! The ticket price includes the fabulous four-course feast (vegetarian upon request), with options like baked chicken, corn on the cob, potato soup, biscuits, and a turnover for dessert!